class="post-template-default single single-post postid-352495 single-format-standard custom-background group-blog header-image full-width singular wpb-js-composer js-comp-ver-5.7 vc_responsive"
SEWARD, Neb. – The ball lived on the offensive end for the top-ranked Concordia University women’s basketball team in arguably its sharpest performance yet this season. 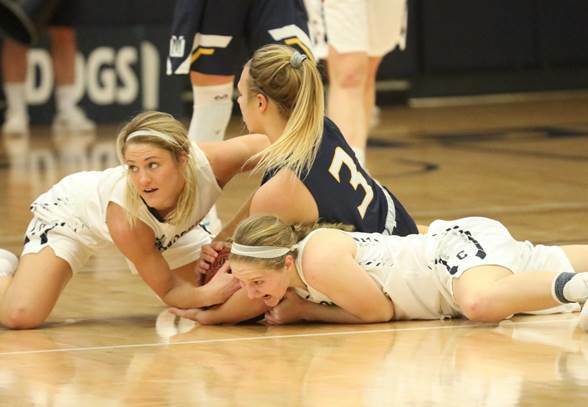 Stars Grace Barry and Philly Lammers dictated the terms of the contest while leading the Bulldogs to a 99-68 home victory over Mount Marty on Saturday afternoon (Dec. 8). The Lancers turned the ball over 43 times. It was a week of utter dominance for 13th-year head coach Drew Olson’s squad, which also blew away Doane, 93-53, in Crete on Wednesday. Concordia has moved to 11-1 overall and to 7-1 in conference play. “I thought our kids came out with really good focus,” Olson said. “The defensive energy was phenomenal. I just liked our pace offensively, too. We’re improving in that area. There were a lot of good things in this game. This was a ransacking. The turnovers mounted early as part of a day that saw the Bulldogs swipe a season high 35 steals. All those giveaways led to a whopping 50 points off turnovers for Concordia. In those situations, Barry knew exactly what to do with the ball. Her wizardry resulted in 13 assists. Six of those dimes were dropped into Lammers, who went 13-for-15 from the floor on her way to a game high 28 points. She added three blocked shots and two steals. While Barry and Lammers collaborated on many of the offensive highlights, everyone got in on the defensive smothering of Mount Marty (4-7, 1-7 GPAC). The Bulldogs do not necessarily need Riley Sibbel to score. She seems to relish getting in the grill of opposing guards. She stole the ball a career high eight times on Saturday. Sophomore guard Taylor Cockerill helped set the tone early by pouring in 12 of her 17 points in the opening quarter – and what a quarter it was. The Bulldogs racked up 37 points over the first 10 minutes. The period’s final bucket came on an out-of-bounds play in which Barry lobbed the ball to Lammers for the deuce inside. Concordia shot better than 70 percent in the first quarter and 52.8 percent (38-for-72) for the game. Twelve Bulldogs registered in the scoring column. Delani Fahey is one of a group of freshmen becoming more confident. She tallied eight points on Saturday while making all three shots from the floor, concluding a week that saw her go 6-for-7 from 3-point range. The lone Lancer to reach double figures was Karlee McKinney, who put up 12 points. Known as a 3-point shooting team, Mount Marty went 9-for-18 from long range. The Bulldogs will be idle until next Saturday (Dec. 15)’s showdown with second-ranked Dakota Wesleyan (12-0, 8-0 GPAC) at the Corn Palace. Tipoff is set for 4 p.m. CT from Mitchell, S.D. The contest will be a rematch of last season’s NAIA Division II national championship game. The two sides met four times during the 2017-18 campaign with Concordia winning three of them.